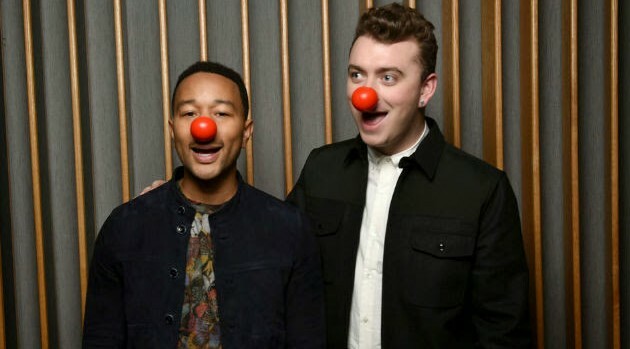 Some of music’s biggest stars will be donning fake red clown noses for a good cause on May 21. John Legend, Jennifer Hudson, Sam Smith and all four Voice coaches — including Pharrell Williams and Christina Aguilera — will appear on NBC’s “Red Nose Day,” a three-hour live event designed to raise money for 12 charity organizations that focus on helping children and young people in the U.S. and around the world lift themselves out of poverty. Some of the charities include Boys & Girls Clubs of America, the National Urban League, Save the Children and United Way. Other stars participating include Will Ferrell, Jack Black, Gwyneth Paltrow, John Krasinski, Emily Blunt, Michelle Rodriguez, Chris Pine and Elizabeth Banks, among others. “Red Nose Day” was started in the U.K. by writer/director Richard Curtis, the man who brought us films including Notting Hill and Love Actually. Over the past 30 years, Red Nose Day has raised more than $1 billion. This first U.S. event will feature music, sketch comedy, parodies, Funny or Die videos, and short films. You can participate by donating during the event, and by buying red noses, which are being sold at Walgreens and Duane Reade stores nationwide.